Acrylic carpet fiber offers the appearance and feel of wool without the cost. Acrylic carpet fiber has a low static level and is moisture and mildew resistant. It is commonly used in Velvet and Level Loop constructions, it is often used for bath and scatter rugs. Acrylic carpet fiber is known as art, art wool, or man-made wool because it is an artificial fiber. These fibers provide the look and feel of wool at a fraction of the cost. Acrylic carpet fiber resists static electricity, moisture, mildew, fading, crushing, staining, and sun damage. However, acrylic fiber is not durable enough for high traffic areas (it fails under abrasion when compared to other fibers). Acrylic fibers are produced from acrylonitrile, a petrochemical. The acrylonitrile is usually combined with small amounts of other chemicals to improve the ability of the resulting fiber to absorb dyes. Some acrylic fibers are dry spun and others are wet spun. 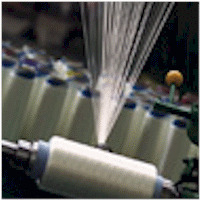 Acrylic fibers are used in staple or tow form. For a detailed production flowchart (wet and dry spun), go here. These fibers are modified to give special properties best suited for particular end-uses. They are unique among synthetic fibers because they have an uneven surface, even when extruded from a round-hole spinneret.